Cupcakes are a sweet little dessert for one of the sweetest days people celebrate - Valentine's Day! Prepare a few for your honey, a party, or to send to school with your kids using festive decorating ideas. Fall in love with this design that spells out how you feel. Tint one batch of fondant with red dye and roll out to approximately 1/8 inch thickness. Use the scalloped round cookie cutter to cut out toppers for each cupcake. Attach the round toppers to each cupcake using royal icing as your adhesive. While the fondant and royal icing set, divide the other fondant batch in two. Tint one batch pink and roll out to approximately 1/8 inch thickness. Tint the other batch red and roll out to approximately 1/8 inch thickness. Use the letter cookie cutters to cut out the letters "l", "v", and "e". You'll need one of each letter for every cupcake. Use a heart-shaped cookie cutter to cut out hearts approximately the same size as the letters from the red fondant. Use a smaller heart-shaped cookie cutter to cut out hearts that will fit on the larger ones, using pink fondant. Attach the smaller hearts to the center of the larger ones using royal icing as adhesive. For each cupcake, assemble the word "love" by using the heart as your "o." Use royal icing as adhesive and squish the letters into each other so the word turns into a larger decorative piece. Add a toothpick to the back of the "l" and back of the "v," leaving enough of the toothpicks sticking out from the bottom to attach to the prepared cupcakes. Allow fondant to harden on counter overnight. 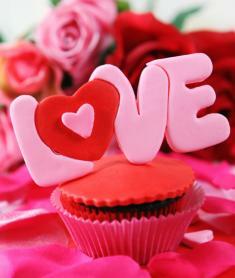 Place the word "love" into the top of each cupcake, carefully pressing the toothpicks into the fondant-topped cupcakes. Use small dabs of royal icing adhesive for additional security as necessary. Skip the overpriced flowers and instead present someone you care about with a pretty cupcake bouquet. Place Styrofoam block inside the metal tin. Use a knife to create a slit in the bottom center of each cupcake liner and cupcake. Slide a wooden dowel through each and set aside. Tint buttercream frosting with pink food dye until the desired color is reached. Fill decorating bag with buttercream and attach the star tip. Hold a cupcake straight using the dowel. Starting in the center of the cupcake, slowly make a swirl design, circling until you reach the outer edges. Carefully line up the final swirl with the previous swirl lines to cover your ending spot. Pat lightly to blend seam as needed. Place in Styrofoam form in the metal tin, pressing the dowel into the foam until it will stand securely. 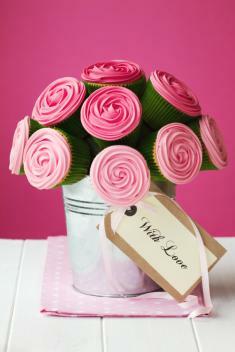 Continue frosting cupcakes and placing in the tin until you have the bouquet shape desired. Attach message tag with ribbon. In many parts of the U.S., Valentine's Day falls during the snowy and cold winter months. Use this as inspiration to decorate some heart-shaped cupcakes. Add cupcake liners to pans. Place a small marble in each cupcake spot, between the liner and the pan, so that the liner creates a point for the top of the heart shape. Fill liners with cupcake batter and bake according to recipe instructions. Allow cupcakes to cool and remove from pan. Use a serrated cake knife to trim cupcake as desired. If you want a more uniform look, purchase silicone molds or liners with a heart shape. Allow cupcakes to cool and remove from wrappers. Coat the sides and approximately 1/2 inch border of the cupcake top with royal icing or poured fondant with a spatula. 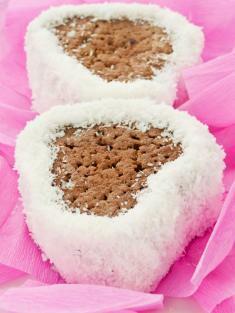 Pat sweetened coconut flakes onto icing so it leaves a smaller heart shape on top of the larger cupcake. Frost cupcakes with white, pink, and red buttercream. Use a cookie cutter or fondant cutter to get hearts from a sheet of red fondant, and stick a heart on top of each cupcake. Decorate with premade Valentine's cake toppers. Spread canned buttercream on cupcakes with a knife, and top with red sprinkles or heart-shaped sprinkles. Frost with buttercream and top each cupcake with an unwrapped Hershey's Kiss. Top cupcakes with romantic Valentine's Day chocolate truffles. Arrange decorated or simply frosted cupcakes in a heart shape before serving. Cupcakes are sized perfectly for gift giving, so plan to make a large batch for sharing. Valentine's Day cupcake pictures and instructions will help you get the look you want for the sweetest of holidays.